The makers of the eagerly awaited Half-Life 2 have appealed for help to track down who leaked the source code of the game on the internet. The software is not the full game but contains core information about it. 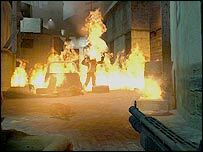 Valve, the makers of Half-Life 2, said the leak followed a concerted hacking effort on the company's computers over a number of months. The source code lies at the heart of a game and is kept a closely guarded secret to stop other people copying it. Half-Life 2 is the sequel to one of the most widely acclaimed games of all time. 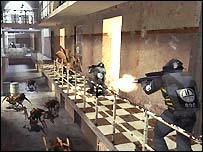 The original garnered numerous awards for its strong plot, complex puzzles and the intelligence of the enemies in the game. The new game had originally been due for release at the end of September before being knocked back to Christmas. But the leak of the source code of Half-Life 2 has raised fears of a further postponement. Developers Valve have confirmed that the software that has appeared on the net is indeed the computer code behind the game. It includes the physics engine, the sound system and various other pieces of code from other developers, but not any of the levels or the graphics. The team at Valve has five years working on Half-Life 2, with an average of 30 people working on the title at any one time. "Ever have one of those weeks? This has just not been the best couple of days for me or for Valve," said Valve founder Gabe Newell, in a statement post on the fan site, halflife2.net. He said that someone had accessed his e-mail account in September. Soon after this, he started having problems with his computer but he was unable to find any virus or worm. Nevertheless reformatted the hard drive and reinstalled Windows. "For the next week, there appears to have been suspicious activity on my webmail account," he said. "Around 19 September someone made a copy of the HL-2 source tree." Mr Newell said that software to record computer keystrokes were installed on several computers at Valve. In his statement, the Valve founder appealed for help from Half-Life fans to find out who was responsible for leaking the code. "There are some pretty obvious places to start with the posts and records in IRC (Internet Relay Chat), so if you can point us in the right direction, that would be great." Valve have set up a specific e-mail account, helpvalve@valvesoftware.com, for people to send any information.